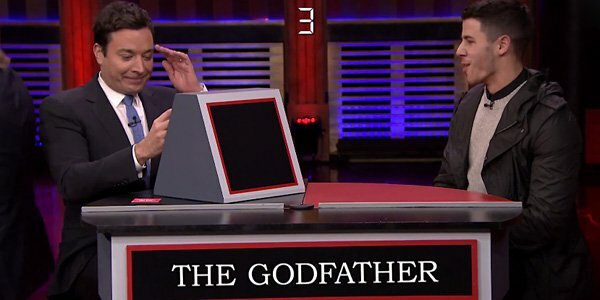 Games are becoming a staple on The Tonight Show with Jimmy Fallon. Last night, Fallon was able to rope in a slew of important guests for a fun game of “Pyramid,” based on the actual game show of the same name. You can check out Usher, Jeff Daniels, Nick Jonas and Fallon playing the game, below. During the game, Usher teams up with Jeff Daniels (it also should be noted that the R&B singer is wearing a sparkly horse sweatshirt). Nick Jonas teams up with Jimmy Fallon. The first category chosen is “Get On Your Feet,” which involves Jeff Daniels doing dance moves while Usher guesses. There’s the robot and a few other basics, but for some reason Usher can’t figure out what the hell Jeff Daniels is doing when he attempts to twerk. It’s pretty glorious. Overall, Daniels and Usher do pretty respectively, but Nick Jonas and Fallon can’t even compete. The late night host incorrectly chooses a gangster-based them and quickly realizes that his 15 year-old compadre has no idea what Scarface or The Usual Suspects is. Just look at the late night host’s pained face. It’s alright that the round is a disaster, as Fallon and Jonas are able to recoup as the game goes on. They wisely choose moving forward, picking a category of items that rhyme with “green” and another that’s all about famous Bob’s (Dylan, etc., although I wish Evans had been thrown in there for good measure). Usher and Jeff Daniels don’t fare quite so well, picking a musical category that Daniels was not so good at and another category about slimy things that netted them only a decent number of correct responses. Pyramid is a game show that has cropped up in numerous forms and on numerous networks over the years. The basic premise is that contestants choose categories and answer questions with a partner related to those categories, as is shown in The Tonight Show with Jimmy Fallon’s version. If there’s anything I’ve learned from watching the show over the years, it’s that choosing the right categories can totally be a game changer, and that was the case with Fallon and Jonas’ later rounds. Fallon’s a man who is quite fond of games and goofy sketches. In recent months, we’ve seen him embark on a breakdance battle with Brad Pitt, put together an “Ew” music video with will.i.am and had to of the judges from The Voice compete against one another in a lip sync battle. If there’s anything you can say about Fallon, it’s that he’s always got plenty of energy. New episodes of The Tonight Show air weeknights onNBC at 11:35 p.m. ET.